Earlier this year, Mandy Moore signaled her ascent into the realm of singer/songwriters, releasing Wild Hope, an ambitious album on which she co-wrote every track. Unfortunately, on Tuesday night at Jannus Landing, Moore’s live showcase of that album, along with a few other songs, proved underwhelming. On tour for the first time in earnest, Mandy Moore appeared out of her depth in translating her recorded music to a live concert setting. For most of the show, she stayed put behind her microphone stand and offered only sparing comments to the crowd, ultimately failing to engage the audience. At times she seemed more intent on getting through the show rather than putting on a show. Beginning with “Slummin’ In Paradise” and “All Good Things,” two of Wild Hope’s strongest tracks, the concert initially seemed promising and, even further along in the show, Moore offered inspired performances. Her voice in fine form, she sounded best on songs like “Can’t You Just Adore Her?” and the ethereal gem, “Gardenia,” which brought the singer to tears. The glaring flaw in the performance, regrettably, rested in her remote demeanor. While her mere presence elicited cries of “I love you, Mandy” from young, teenage girls, as well as from older, college-aged boys (underscoring two completely different sentiments, mind you), her ability to interact with the audience seemed awkward, if not amateurish. She often spoke to her band members and occasionally introduced a song, but she rarely thanked the audience for its applause or enthusiasm. Mostly, though, she looked genuinely uncomfortable in her role as a concert performer. She concluded the set with a slow rearrangement of Rihanna’s hit single, “Umbrella,” as well as a revamped version of one of her own past hits, “Candy”. The latter song, she inexplicably conceded, held no sentimental value for her whatsoever, despite the crowd’s palpable desire to hear it. That moment, more than any other of the night, symbolized the disconnect between Mandy Moore and the hundreds of fans who attended her show. 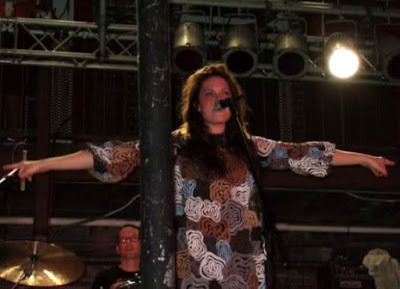 While some allowance should be given for her live inexperience, the audience did its best to embrace Moore, but she unfortunately neglected to do the same with her audience.